Roosevelt maintained contacts and mended fences with the Democratic Party during the 1920s, especially in New York. Although he made his name as an opponent of New York City's Tammany Hall machine, Roosevelt moderated his stance. He helped Alfred E. Smith win the election for governor of New York in 1922. Roosevelt gave nominating speeches for Smith at the 1924 and 1928 Democratic conventions. As the Democratic Party presidential nominee in the 1928 election, Smith in turn asked Roosevelt to run for governor in the state election. 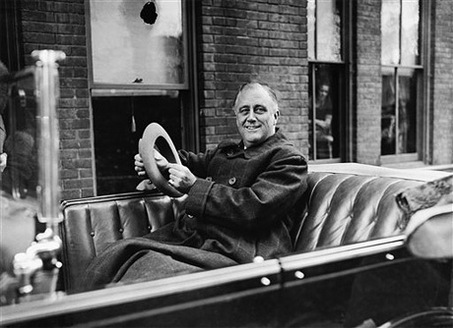 While Smith lost the Presidency in a landslide, and was even defeated in his home state, Roosevelt was narrowly elected governor. As a reform governor, he established a number of new social programs, and he was advised by Frances Perkins and Harry Hopkins. In his 1930 campaign for re-election, Roosevelt needed the good will of the Tammany Hall machine in New York City; however, his Republican opponent, Charles H. Tuttle, was using Tammany Hall's corruption as an election issue. As the election approached, Roosevelt initiated investigations of the sale of judicial offices. He was elected to a second term by a margin of more than 700,000 votes. By 1928, Roosevelt believed he had recovered sufficiently to resume his political career. 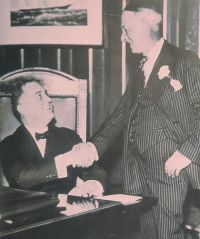 He had been careful to maintain his contacts in the Democratic Party and had allied himself with Al Smith, the current governor and the Democratic presidential nominee in 1928.